If we were having coffee, I would apologise for meeting with you so late – and after the weekend has ended. The weekend was exceptionally busy – as well as the week leading up to it. Thankfully for the next 5 days I will be able to take things a little slowly and catch up a little on my blogging and book reviews as it is March Break – a week in which the schools are closed. The week leading up to the weekend went by quickly – though my students were very excited for the upcoming break. Two of them left on Monday so I had two children left in my class. During the week, I kept hearing snippets of where others were going: Florida to see The Wizarding World of Harry Potter, Switzerland, Amsterdam, and even Montreal. While these children are jet setting all over the world, I plan to stay at home to relax and little and to study. Study? you may ask. Yes, my March Break began with attendance at a crash course by Canfit Pro to become a group Fitness Instructor. As you already know, I have done my basic Zumba Instructor training. In order to teach at the gym, I need to do my certification with the Canadian licencing board. The books I spent the weekend with. The course began at 4pm on a late Friday afternoon and finished on Sunday at 4pm. The weekend was filled with information and lots of new learning. Some of it was very interesting – and gave me insight into not only what the group fitness instructors are doing, but also what they are not. I came home on Sunday afternoon exhausted and sat myself in front of the TV with my crochet. It was a good place to unwind. I am currently catching up on my viewing of Grey’s Anatomy. I do prefer waiting until all of the episodes are uploaded on Netflix as then I do not have to wait an entire week before finding out what happens next. I am sure that by the end of this week I will be caught up. Then I will be faced with the dilemma of what to watch next! If we were having coffee, I would leave you now as I have my weekend chores to catch up on. If we were having coffee, I would tell you that I am tired to the bone and cannot wait for the next school break. Last week in particular was tiring as there was so much to do. The week did seem to fly by, though, and I cannot believe that the weekend is almost over. What I do want to be over is Winter. The ground outside is still covered in white – in fact we had some snow fall on Friday and Saturday. We all keep hoping for Spring but right now it seems so far away. I am tired of wearing the cumbersome winter gear and I cannot wait to hear birdsong and see leaves on the trees. If we were having coffee, I would tell you that my week began with attendance at the Youth Arts Program event on Monday evening. Both my daughters submitted a piece of art for the exhibition that is held every year at the Ontario Legislative Assembly and Monday night was the opening night. I am so proud of my girls and pleased that they are confident enough to put their art out into the world. On Tuesday I took my class on a field trip with the other grade 1 teachers to attend the Gregg Le Rock concert. As always, the children had fun singing and dancing to songs that we had been playing in class. The trip was tiring though as I was with the children the entire day – even during lunch time. We got back to school after lunch and ate together in the classroom. It was such fun seeing the children get excited about singing in French at the concert. Their favourite song is definitely the Terry Fox song which they sang with enthusiasm. Wednesday at school was another fun-filled day as the entire school participated in organised activities for our Carnaval (which is based on a winter tradition in Quebec). This year I ran a station – one on dance. I created a Just Dance playlist and the children danced to the videos I projected up on the wall. What fun we all had! The station was a favourite for many children. Other stations included bingo, flag making, and plasticine building. If we were having coffee, I would tell you that by the end of the week I was bone-tired. I have rested a bit over the weekend but am still feeling fatigued. I am looking forward to the upcoming school break – only one more week to go! If we were having coffee, I would welcome you in rather late on this Sunday afternoon. It has been a busy weekend and I would welcome a little chat before completing my chores for the day. If we were chatting, I would tell you that even though the work week was short (Monday was a public holiday), the week was very busy. There seemed so much to do at work – it is almost as if we squeezed five days of work into four. In addition, I had my evaluation on Friday and I was busy getting ready for it in the days leading up to Friday at 10:25am. Every five years, the teachers in the school board I work for have an evaluation – which basically means we are observed by the administrator of the school. Our principal came in to observe one of my lessons (I chose to do a language lesson). My students were a lot calmer than usual (though they were not little angels 🙂 ). My principal and I had a chat after school and I explained how I do some things (she is new to the school and therefore does not know how I work). She is going to type up her report and share it with me once she is done. If we were having coffee, I would tell you that I have just come back home from an event at the Harper Collins Canada Publishing House. Today’s event is the one they hold for bloggers in Ontario and the one at which they tell us about the upcoming new releases in Young Adult fiction. I enjoyed learning about the new books as well as chatting with other readers who love books and share their love through blogging. I am new to their influencer program and am starting to get to know other Canadian book bloggers. If we were having coffee, I would tell you that I have two events this week to look forward to – one with my daughters, and another one I can attend as a teacher. But that is for the next coffee chat. If we were having coffee, I would tell you that this weekend we are enjoying a long weekend. Tomorrow is a public holiday titled Family Day and it is a perfect break from the Canadian Winter weather. The day is a perfect time to do activities with your family. My family and I will be relaxing – which for my daughters and husband means a late morning sleep-in 🙂 My husband intends to try out a new recipe so I foresee a lot of time spent at the dinner table. If we were having coffee, I would tell you that we had a snow day on Tuesday. I got up as usual in the morning and, by the time I was ready to eat breakfast, I learned that not only had the school buses been cancelled but that the schools in the school board I work for had been closed. I was surprised by the decision – especially as the snow storm had not yet started. The unexpected day off, though, was a pleasant surprise which I spent reading and relaxing. Once the snow storm started it was not at all pleasant outside and I was pleased to be indoors. If we were having coffee, I would tell you that this week my student’s report cards were sent out and I met up with a number of parents to discuss their child’s progress. I also had an open class for a couple of hours so that the parents could come in to view their children’s projects as well as to see their portfolios. It was good chatting with the parents and seeing the children proudly show their mom or dad what they had done. 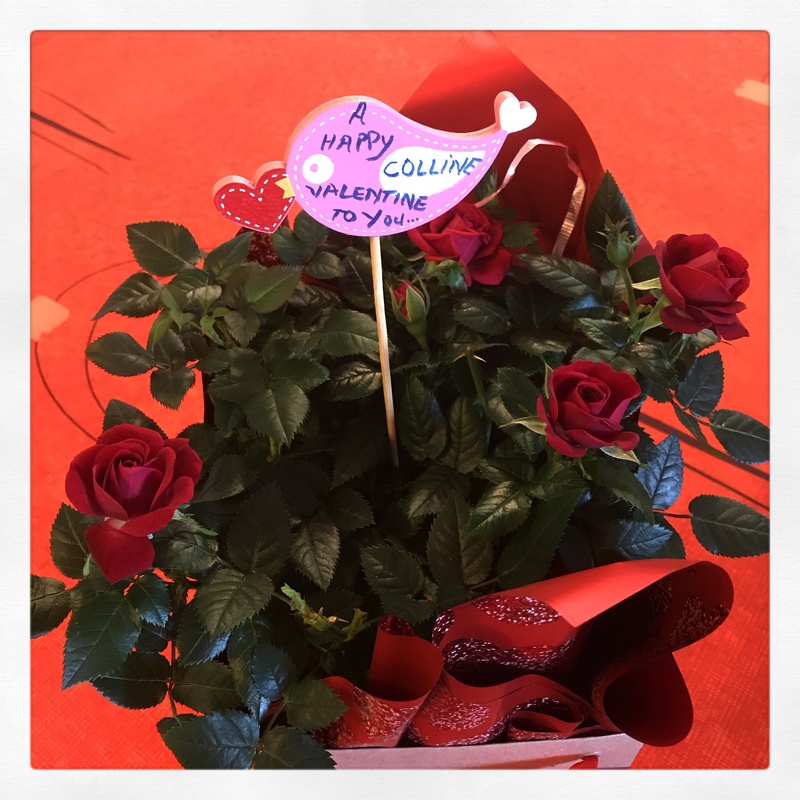 If we were having coffee, I would tell you that Valentine’s day was a low-key celebration in my classroom. The children brought in cards which they gave to one another. 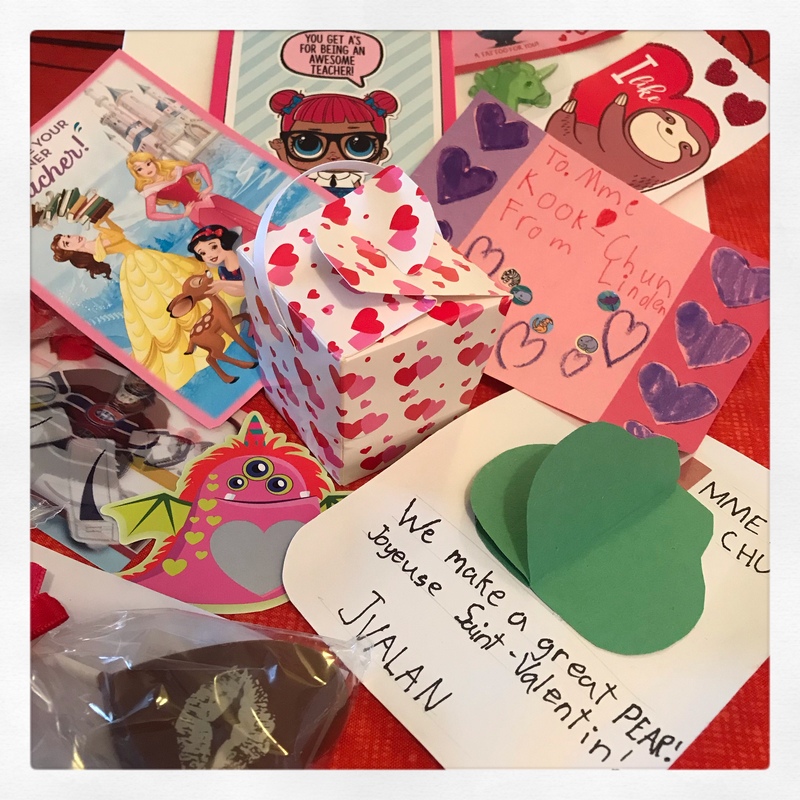 I did not have a class party, but I did give them the time to read one another’s cards and even eat a candy or two that had been attached to a card. My students also wrote out cards for me – and I particularly enjoyed the homemade ones. I smiled at the one made for me by a student with a good sense of humour. He worked very hard on his cards as he individualised each one for each person in the class. My week has been very laid-back. My next week will be a bit busier albeit a short one. May yours be fruitful and enjoyable. If we were having coffee, I would greet you with a tired smile and a bit of a cough. This week my body insisted on resting and saddled me with a cough and runny nose. I guess it was my turn to get sick! I still went into school as my students were presenting their projects during the week and I needed to be there to assess them. They did a good job with their projects and they were so excited to share what they had learned about one of their ancestral countries. I plan on inviting the parents into the classroom next week to come and have a look at what the children have done – and for the children to have the opportunity to share what they have learned with parents. If we were having coffee, I would tell you that the weather this week has not been too pleasant. After a very mild weekend, the temperatures dropped and with it came precipitation in the form of ice pellets and snow. We experienced a couple of days in which we had indoor recess. I made sure the children had an opportunity to get rid of their excess energy by putting on Just Dance for them. Most of the kids enjoy this activity though there are some who do not enjoy moving their bodies. If we were having coffee, I would tell you that I read a Middle Grade novel during the past week – Inkling by Kenneth Oppel. I really like his writing and loved this story. Keep a look out for my review this week if you are on the look out for a wonderful story for 7 – 12 year olds. If we were having coffee, I would tell you that on Monday evening my family and I went to dinner to celebrate the start of the Chinese New Year. We had a wonderful time eating delicious food. I loved the atmosphere in the restaurant and could not resist snapping a few pictures of their decorations. We ate until we were too full – definitely too many dumplings! As always, we enjoyed the variety of the buffet and ended the meal with a few bites of dessert. If we were having coffee, I would tell you that I intend to rest this weekend and hope that by Monday my throat will no longer be aching.